During the summer of 2012 I was working on an animation project for the Brighton Photo Biennial, working in partnership with Photoworks, Brighton & Hove City Library Services and the Youth Arts Project, part of Brighton & Hove City Council’s Youth Service. The brief was to provide a series of animation workshops for young people exploring the Biennial’s theme of the Politics of Space and to create digital stories for an exhibition at Jubilee Library. The project is called Tales of the City. As an animator I am drawn to methods that are comparably low-tech by today’s standards. I’m fascinated by antiquities such as Zoetropes and Magic Lanterns and I love the organic nature of traditional drawn animation and stop motion puppetry. I think it’s important to be hands on and to have a physical connection with your work. Animation is a method of performance because your work is the result of your own personality. Your characters are born of you. The relationship between the animator and the world that they create is one that is very personal. I was eager to introduce the young people to as many different animation techniques as possible so as to really allow them to experiment. 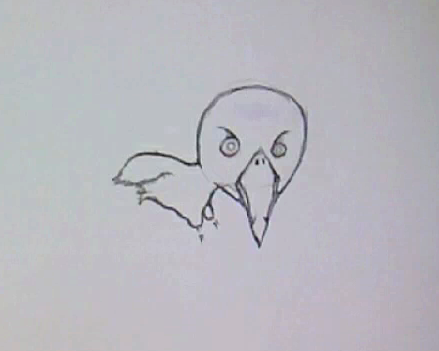 Experimentation is what animation is all about. It was through experimentation that moving image was born and that experimentation allows the medium to evolve constantly. I wanted to include some examples of this evolution in my work for this project. I started with simple optical illusions based around the concept of persistence of vision – thaumatropes, zoetropes and flick books. It was important to me to begin by demonstrating how animation can be created without the use of cameras and computers, especially when working with young people who may not have access to such equipment at home. For me, the digital process is necessary to my work, but secondary to the drawings, puppets and sets that I create. The computer is there as a capture device and to refine the work in post-production but what an animator can produce with their own hands is the true magic of the medium. The young people began by making thaumatropes – optical toys that create an illusion by combining two images on either side of a disk when it is spun quickly. I wanted to start with something small and simple that would produce an instantaneous result. Animation can be so time consuming and requires such patience that it can be off-putting for beginners and the real joy for someone having a go for the first time is to see their creation come to life in front of them. As important as it is for people to understand animation methods and techniques, it is vital for them to experience that little bit of magic for the first time. As well as an understanding of techniques, it was important to also build an understanding of the Biennial’s theme into the work. The Politics of Space is a difficult concept to engage with and the challenge was to distil it into something that would engage young people and lend itself to creative work. The key was to make it relevant to them, to allow them to engage with the ideas and relate them to their own experiences. I decided to focus on local identity and the relationship that the young people had with their environment, using this to introduce them to the underlying politics within their space. To begin with, we explored Brighton’s identity through discussion and drawings, creating a palette of Brighton iconography to draw into our animations. 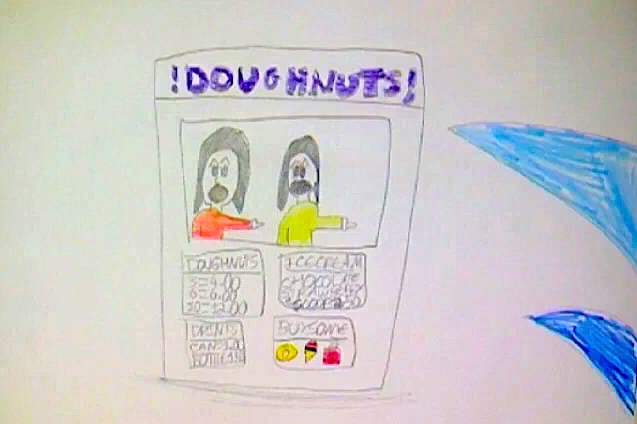 The young people created imagery that typified Brighton and then translated it into a beautiful hand drawn animation. We then explored particular spaces on a closer level, discussing where the young people felt safe and welcome, where they liked to hang out and what places they avoided. It was interesting to explore Brighton from their perspective and to examine the different atmosphere and personality that you will find in different areas around the city. I wanted to make the young people aware of the politics of space by getting them to consider the rules and social norms they observe around the city and how these can change or influence their behaviour differently in different places. After discussing Brighton’s various neighbourhoods I asked the young people to choose one space which they had all been to and that they thought had potential to explore through animation. The young people selected Brighton Marina, which is close to where a number of them live. Brighton Marina is an interesting example of the politics of space at work in our local community. By its very location it is separate from the city with only one main route in and out by car and minimal pedestrian access, making it an almost self contained space. There is the obvious geographical divide between land and water. The residential part of the Marina is gated, restricting access to only those that live there, creating a landscape of barriers and exclusion. There is also a social divide as the expensive boats of the Marina are symbols of a lifestyle that only few can afford and yet its location, just south of Whitehawk means that some of the city’s least affluent residents use it as their nearest source of leisure. 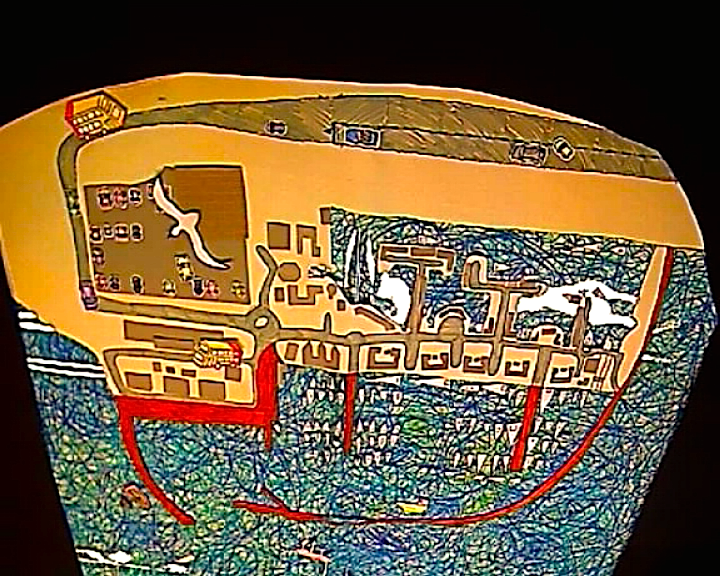 The young people explored maps and aerial photos to create a bird’s eye view of Brighton Marina, which they animated using paper cut out techniques. We started by creating our set and then breaking it down into moving elements such as the sea, cars, buses and boats. All of these were then combined to create a day in the life of Brighton Marina. The young people then discussed their own relationships with the Marina – how they get there, what they do when they’re there and where they do and don’t go. These experiences were recorded as voice over, so that each member of the group could tell their own story. Finally, each member of the group made a paper cut-out version of themselves to animate their part of the story. Every Saturday throughout the Biennial, the young people shared what they learnt through drop in animation workshops or children aged 5-11 at Jubilee and Whitehawk Libraries. All of the work created for this project was exhibited in the Young People’s space at Jubilee Library during the Photo Biennial. 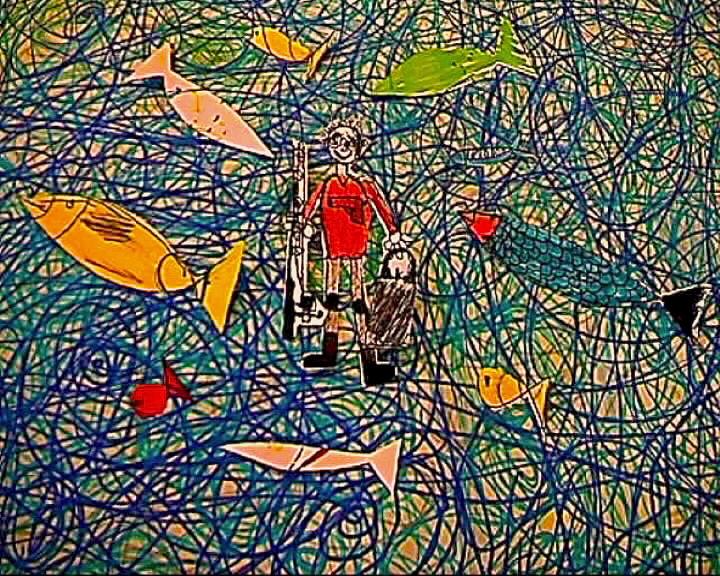 This entry was posted in Animation, Exhibition, Portfolio, Short Film and tagged Animation, arts, brighton, Brighton Marina, Brighton Photo Biennial, Community, Jubilee Library, Model Animation, Paper Animation, Paper Cut Out, Politics of Space, Stop Frame, Stop-Motion, Whitehawk, Workshops, Youth Projects on July 23, 2015 by Evan Wilkinson. For my major project at University, I wrote and directed Elysium, a short film based on the myth of Orpheus and Eurydice. 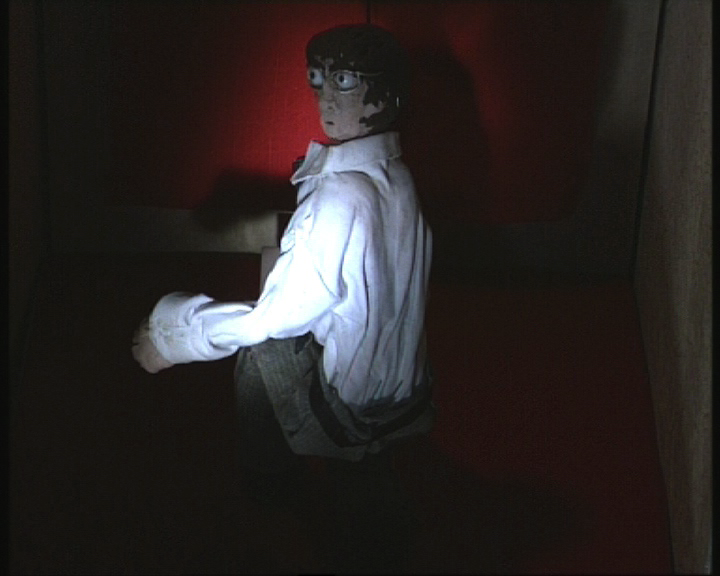 The film combines live action with stop motion animation. I also designed and built sets and puppets for the film. In the original story, Orpheus’ lover Eurydice is bitten by a snake on the day of their wedding. She dies, and Orpheus travels to the Underworld to beg Hades to return her to him. Hades agrees, but only on the condition that Orpheus leads Eurydice through the Underworld and back to the land of the living without looking at her. Orpheus finds Eurydice and leads her through the Underworld, but at the last minute he looks back to see her and she dies a second time, this time forever. In our adaptation of the story, Chris is the Orpheus character and his wife Laura, Eurydice. Laura is in a coma and the doctors have told Chris that there is no hope of her waking up. Chris visits a strange organisation, who offer him the chance to bring Laura back by travelling into her dreams to wake her up. 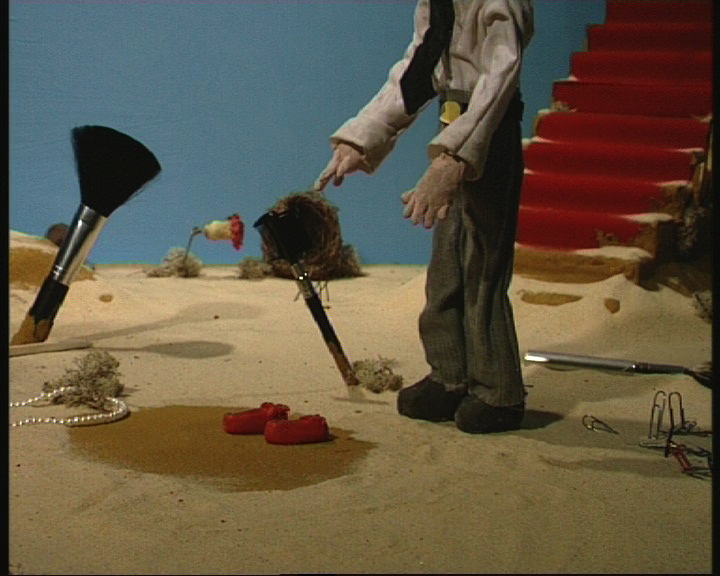 The real world is filmed in live action, on digital video, and the dream world is animated with stop motion puppetry. We constructed a hospital set in the studio, using flats that we wallpapered and painted and then hiring hospital props to give it an authentic feel. We visited an amazing company in London that had a huge warehouse full of hospital equipment and furniture for hire from different eras. 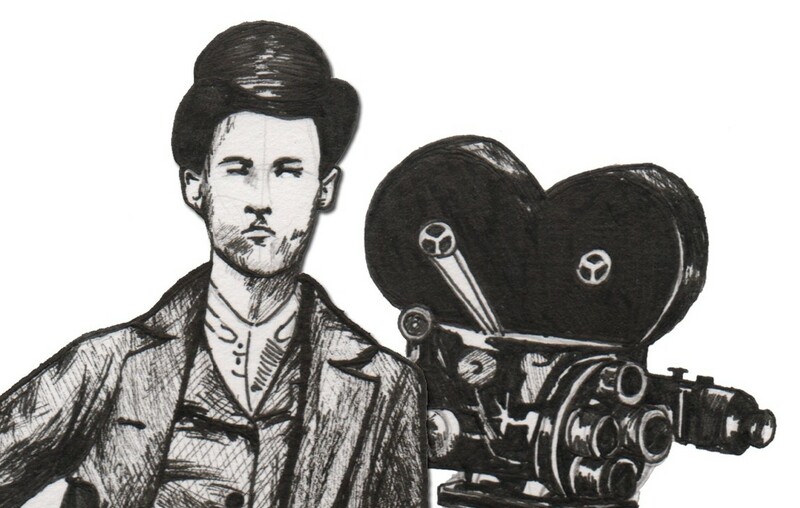 We wanted the film to have a very stylised look. As we were dealing with fantasy it was really important that the film have a dream-like look and fluidity. This was the opening scene and I wanted it to be moving and enigmatic. 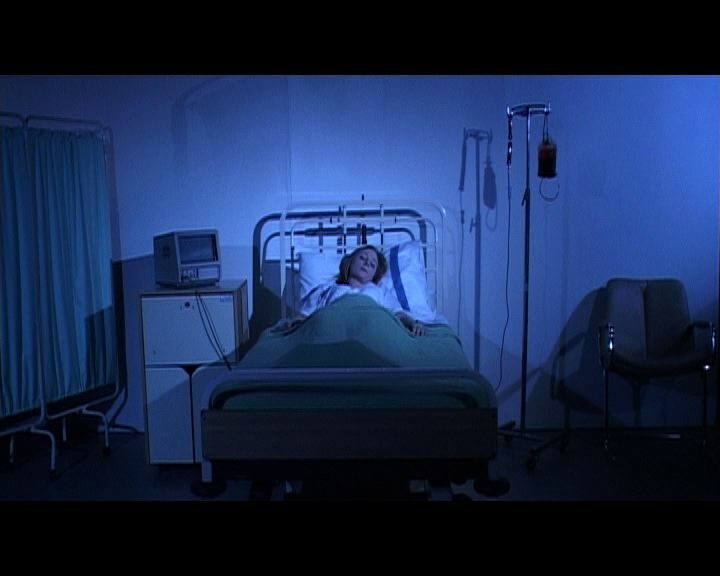 I chose cold blue lighting and arranged it to look like a spotlight around Laura, focusing attention to the centre of the screen and making the edges of the shot shadowy and vague.The idea of this scene was to introduce Laura and her plight in a way that was heightened, as if it was Chris’s nightmare. I wanted to represent Laura as a Sleeping Beauty and suggest the danger that she is in. I decided to show this by using an imperfect match cut from the tubes in Laura’s hand to a snake coiling itself around her wrist, drawing on the imagery from the original myth. We used a real snake for this shot. We hired it from a taxidermist. It hadn’t been stuffed yet and it was being kept in a freezer. We needed to defrost it and keep it in the fridge between takes. It smelt horrible, and it was a pretty gross thing to handle. Our actress had to be really patient and keep her hand perfectly still while we animated it frame by frame. I was really pleased with the final effect. 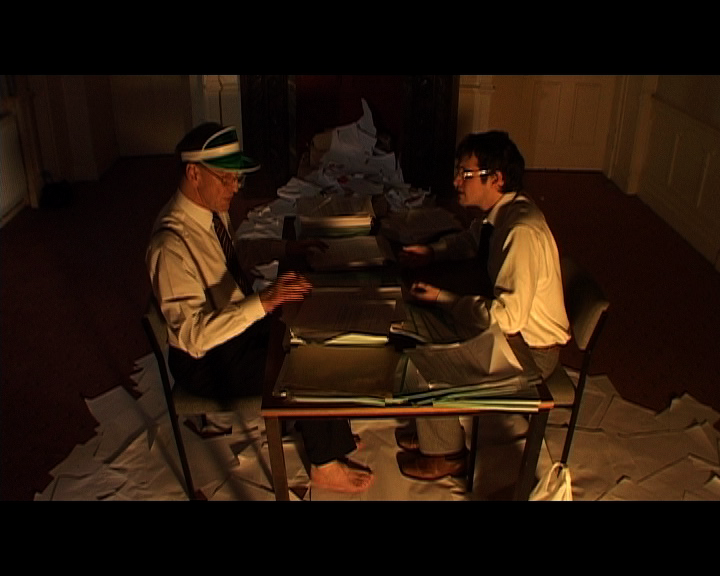 For the organisation itself I wanted to create the idea of the afterlife as an inefficient bureaucracy. I had in mind that any organisation that deals with the public en masse – the tax office, the passport office, the job centre is a place of waiting rooms, queues and endless paperwork. If there is an afterlife, then in centuries of human existence it will have been inundated with souls that would be a nightmare to process and organise. For this reason I saw the lord of the underworld as an overworked filing clerk or administrator. The passage from the waking world into Laura’s dreams was a difficult one. Not only did the character need to cross a metaphysical plane, but we also needed to make a transition from live action to animation. I have always been attracted to the illusion of cinema and so I decided to represent Chris’s journey as a magic trick of sorts. 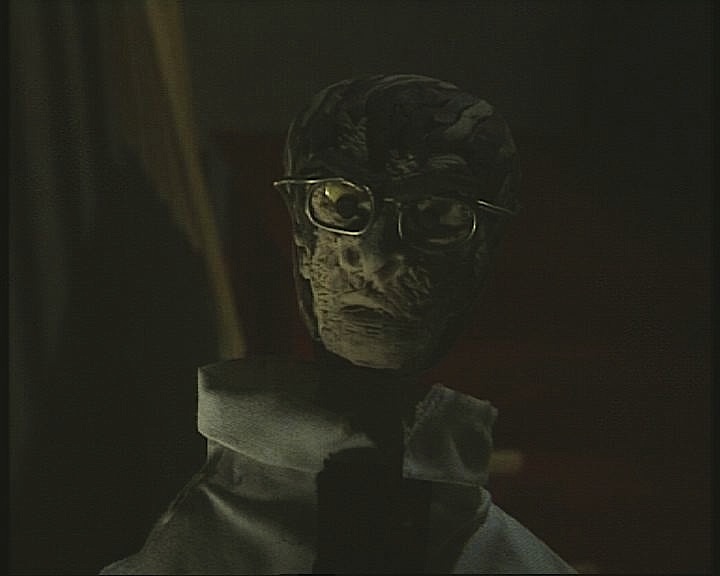 Later in the film we mirrored this shot with the animated Chris. To further the magic trick imagery we built a box for Chris to climb into. We wanted to create a magic and shamanistic method by which he could make this journey, and we used images of boxes and doors being opened throughout the film. Chris is shut inside the box with a poisonous snake. We wanted to use the snake to link Chris to Laura through this experience, and also to suggest that the snake’s venom would cause Chris to hallucinate. 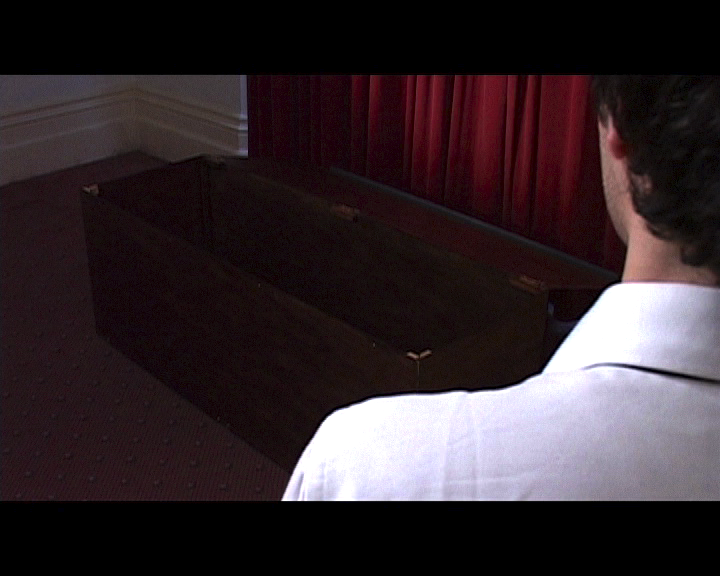 Chris loses consciousness, and when he wakes up, he is a puppet inside Laura’s mind. The challenge with Chris was in trying to make him look like Evan Locke, who plays Chris in the live action segments of the film. We learnt the hard way on this film that plasticine doesn’t retain much detail under lights, as it melts in the heat. Most of the resemblance was achieved through the costume. I remember spending a lot of time trying to model Evan’s face in plasticine but I think a lot of this detail was lost as soon as we started filming the puppets. Elysium also saw a change to the design of my armatures, as I began using plastic tubes in the place of wooden dowels to create the puppet’s limbs. 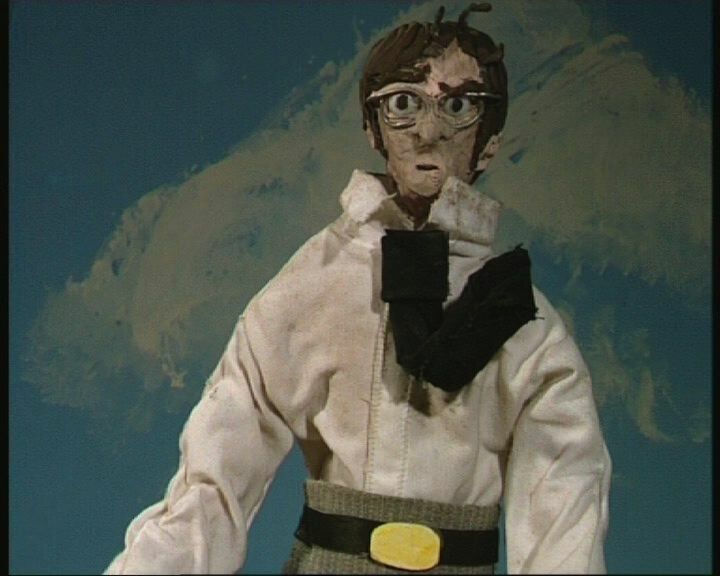 This enabled us to have lighter, slimmer puppets, which looked great but made them much harder to animate! We had a lot of broken limbs on this production, but we put the puppets through a lot, expecting them to climb stairs, fight and fall over, none of which are as easy to animate as you would imagine. I also chose not to use paper for the facial features on this production and set plastic eyeballs into the skulls of my armatures instead. I then created the pupils using a small ball of plasticine that I could then move and widen as and when I needed to. 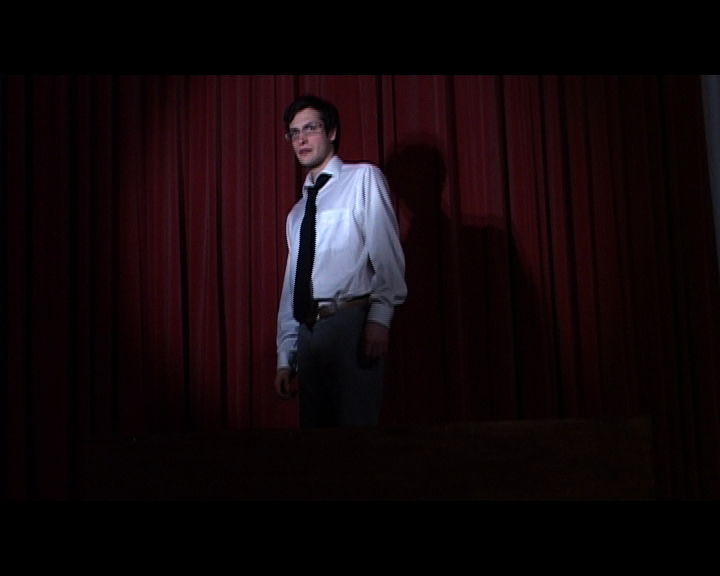 One moment I particularly like from the film, is when Chris’s tie blows in the wind. I achieved this effect by lining the tie with wire that enabled to manipulate it into position shot by shot. It’s these sorts of tiny details that I really like to take my time with in animation. For the first dreamscape, I wanted to create a sort of Dali-esque wasteland. This set represents the outskirts of Laura’s mind which at this stage I wanted to show as a sort of cluttered lost property of artefacts and memories. As we are now in the realms of the imagination and dealing with dream logic, I wanted to create a confused sense of scale. I also love to combine real objects with puppets when I animate which is a theme I developed throughout the sets for this section of the story. I wanted this to be a feminine landscape, and so I littered the set with items you might find at the bottom of a Laura’s handbag. 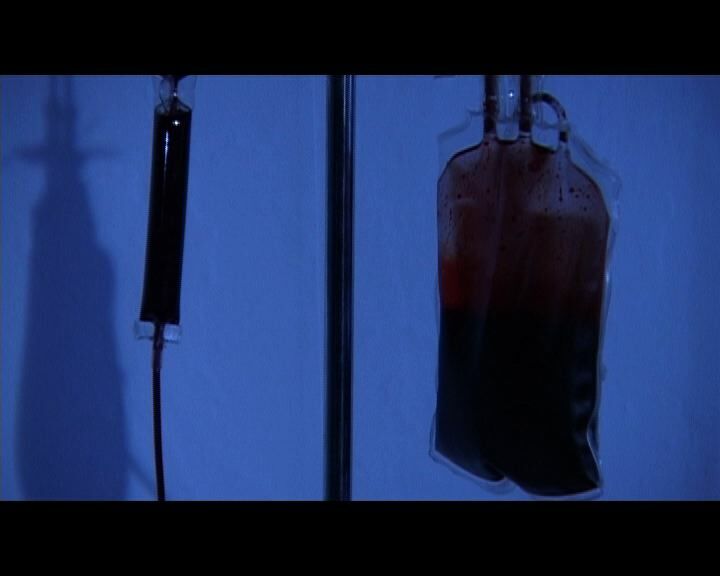 Laura’s condition throughout the film makes her a distant character, as these sets represent Laura’s internal world, they are a way to provide small character details visually. Now that Chris has left the physical world, dream logic rules over everything and that includes the dimensions of the sets. Items move between shots and each set was designed to overlap so that we moved between scenes in a fluid way, as if dreaming. 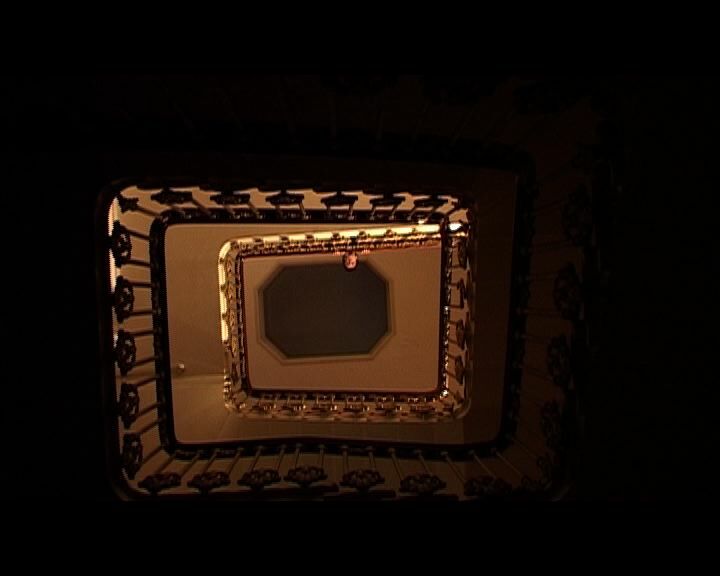 The staircase leads up to a landing where the next scene takes place. In order to overlap the two sets we built a detachable stairway into the landing set, so that it could be used for Chris to travel from one set to the other. 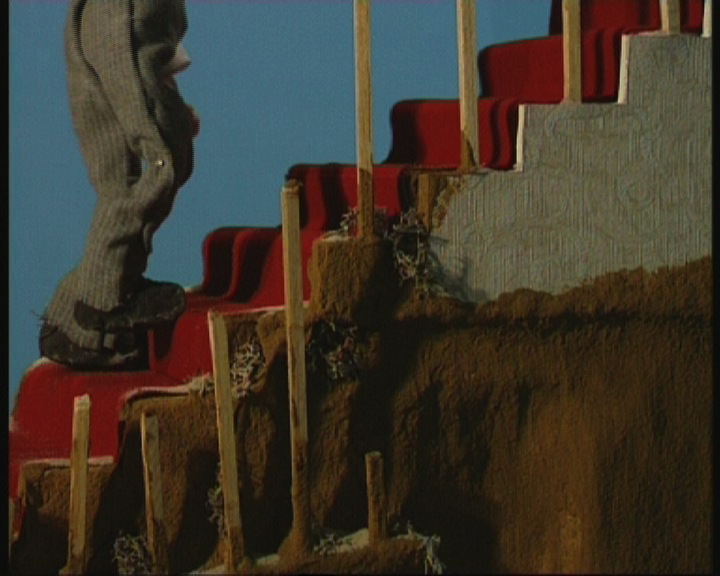 We also tried to blend the stairway into the wasteland set, covering it in sand so that it seemed to have risen up out of the set organically. The landing set is a deeper level of Laura’s subconscious, where we begin to see elements of her memories and dreams. 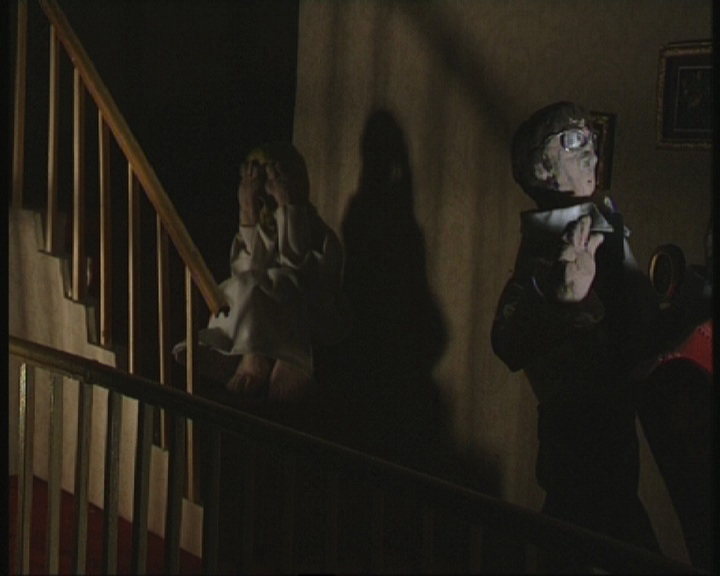 The scene is actually based on a recurring nightmare I had as a child, about trying to walk along hallway without waking someone up. In the layout and lighting of the set I wanted to convey a sense of unease and tension. 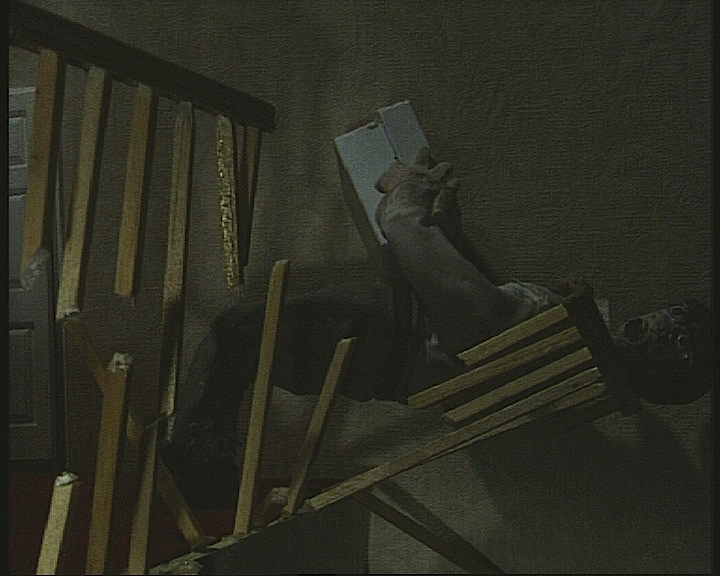 The landing is narrow and the bannisters of the stairs cast threatening shadows. We constructed the base for the sets out of dense polystyrene, which I tend to use as a base for most animation sets as it is a good material for pinning the puppets into. This might be the most difficult set I’ve had to build. Firstly, it had so many dimensions, two staircases and landings that needed to be measured out and fitted together perfectly. The staircases then had to be carpeted with adhesive velvet that needed to be cut to fit, then we had to build railings and bannisters. I also needed to be able to remove one set of stairs to slot into the wasteland set for the transition from that scene to this one and in the second scene this set was used for the whole thing needed to fall apart on screen. We had to do a lot of planning and make sure we had all of the shots we needed from each scene before filming the final destruction. 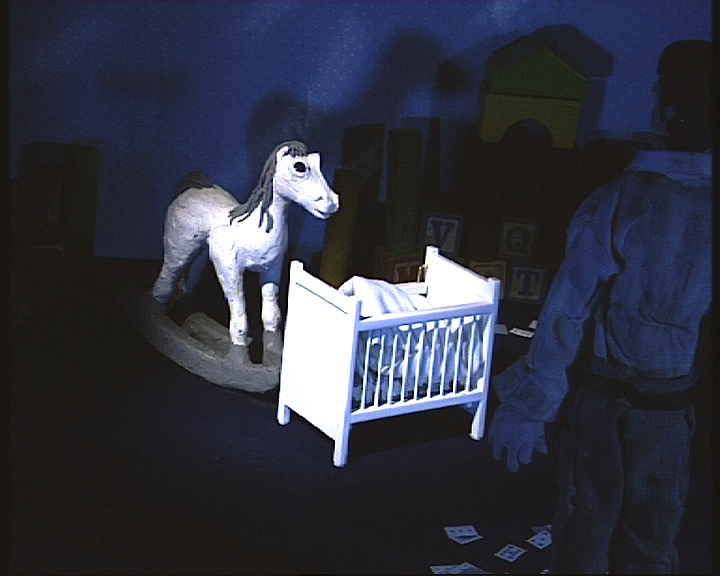 The third set built for the animated segment was the nursery. 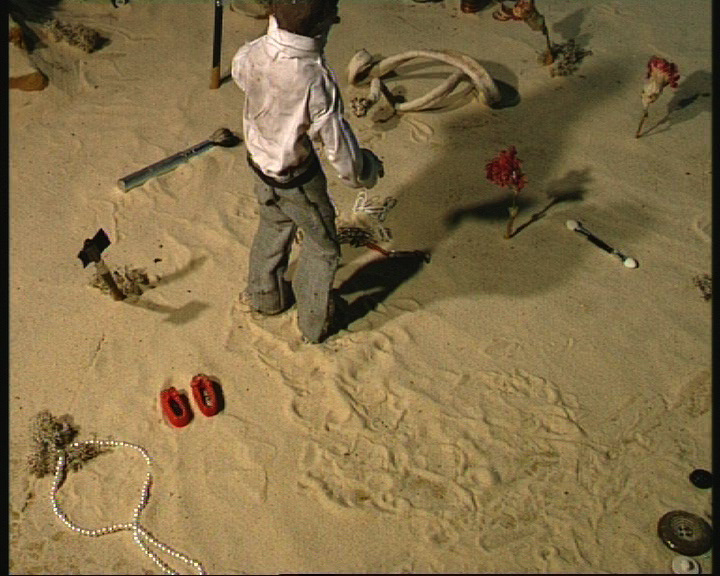 This scene is probably the most abstract in the film and deals again with a combination of Laura’s dreams and memories that are difficult to interpret. With this set we played around with scale again, using a combination of real childhood toys alongside doll’s house furniture and toys that were made to a much smaller scale. I like the strange quality it gives to everything. As we weren’t trying to represent the real world we were able to have a lot of fun with the set and characters for this scene. 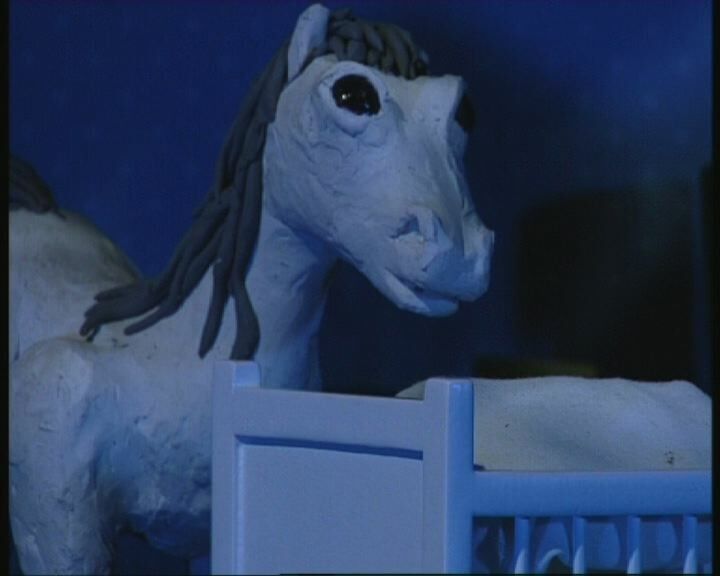 the Rocking Horse is my favourite puppet, which I will talk about in more detail in a later post. We also created a nightlight effect by cutting stars and crescent moons out of paper and moving it across a spotlight throughout the scene. The Rocking Horse is one of my favourite puppets because it is so different from any of the other puppets I have made and I spent a really long time trying to get the details just right. As the horse moved on rockers the armature only contains one joint, which is at the neck. The horse’s body and rockers are constructed out of styrofoam which was cut and then sanded. I spent hours sanding the horse’s legs and body to make it look authentic. I sank shiny black beads into the horse’s skull to give him his eyes, then the whole armature was coated in plasticine. It took a long time to get the details of the horse’s face right. It was important that the character, though mysterious, came across as a benevolent and protective figure. As it doesn’t speak this all needs to be conveyed in the look and the movements of the character. Doppelganger Chris needed to look like an aged and monstrous version of Chris. He represents a nightmare version of Chris, the embodiment of all of Laura’s relationship anxieties and fears for the future. 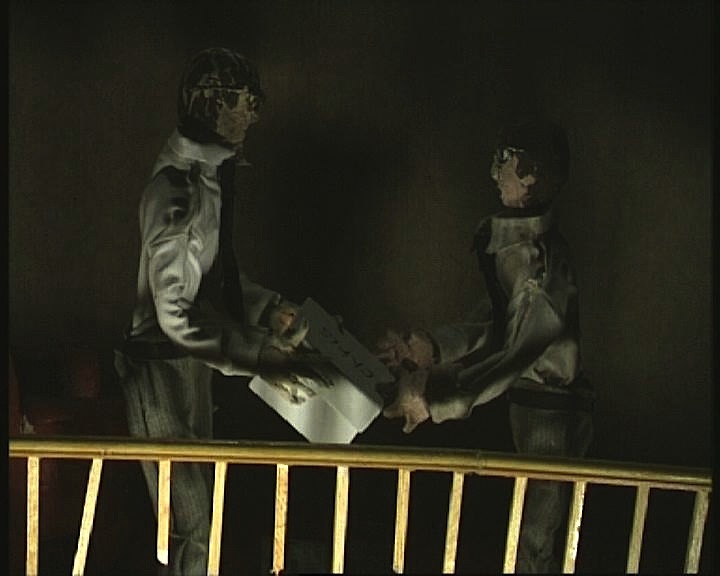 I constructed the armatures for both Chris and the Doppelganger at the same time so as to keep them in proportion to each other, with Doppelganger being a little taller so as to be dominant in the scene. Doppelganger Chris was given yellow eyes instead of white, and we used a dirtier skin tone for him. His fingers were thin and spiky, his features more severe and I etched lines into his face to give him a grizzly, wrinkled look. Unfortunately Doppelganger Chris didn’t survive the shoot as we ended up using various parts of his body and costume as replacements for the Chris puppet. Elysium isn’t a perfect film, but it’s still a piece of work that I’m really proud of. I was experimenting with a lot of different ideas when I wrote the script, exploring dreams, desires and the unconscious. 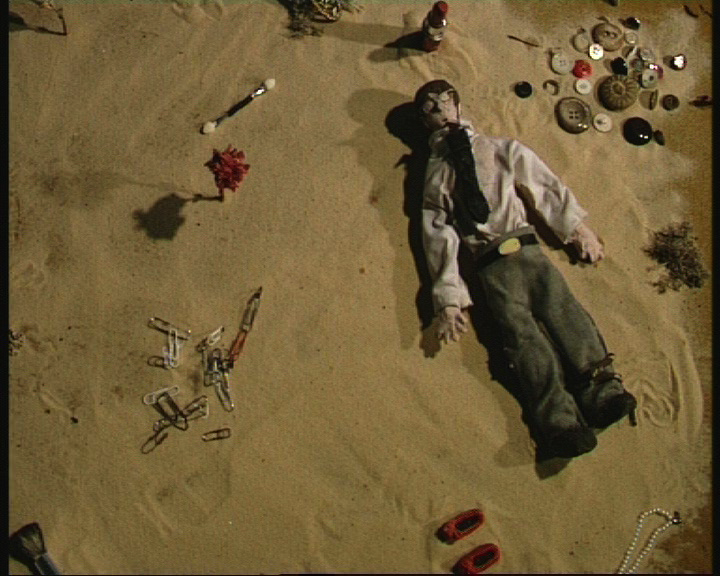 I was really influenced by surrealist animation, particularly the work of Jan Svankmajer, as I was writing my dissertation about him at the time. Alice, his adaptation of Alice in Wonderland, was a film that I made a few nods to throughout Elysium. Elysium was also influenced by other quest stories like The Wizard of Oz and fairytale adaptations such as Powell and Pressburger’s The Red Shoes. 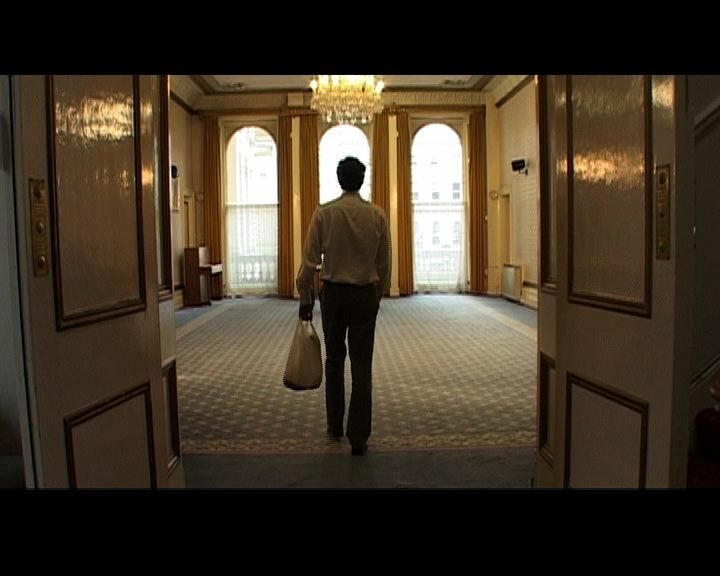 I was also influenced by Hirokazu Koreeda’s After Life which is one of my favourite films of all time. 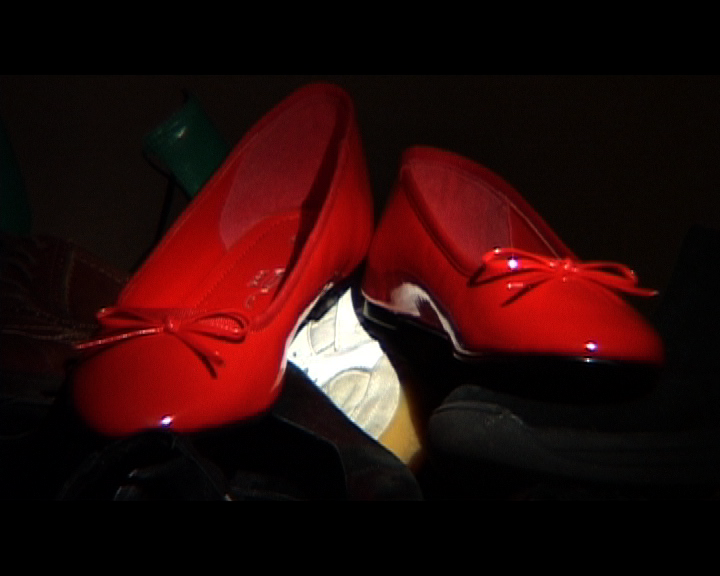 The red shoes represent Laura’s spirit or soul. They allowed us to make her present but not visible. 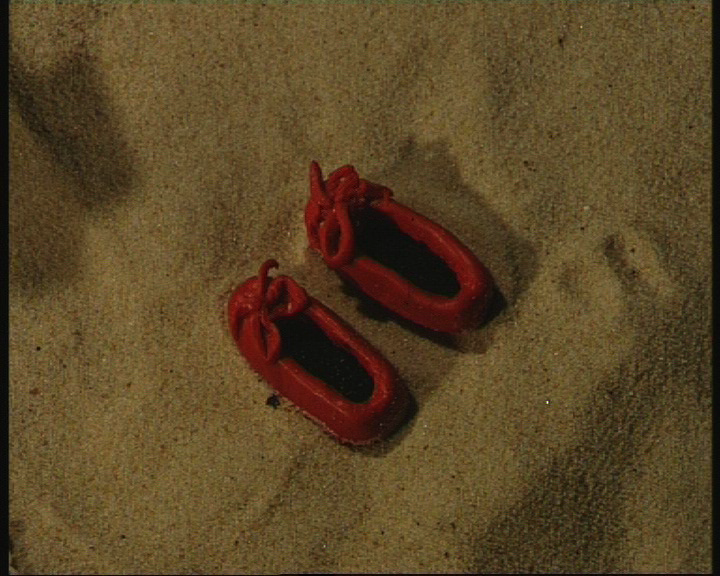 The pile of shoes that Chris sees in the Underworld are the souls of the departed, the film ends with us seeing Laura’s soul join the others for eternity. The workers at the Elysium organisation exist between both worlds, they are neither living or dead, so they have bare feet. This is one of a few mysteries that I left unexplained in the film as I wanted it to be dream-like and open to interpretation. If you have any thoughts or questions about the film, please comment here or contact me through twitter. To find out more about me and my work, please visit my website. This entry was posted in Animation, Portfolio, Short Film and tagged Adaptation, After Life, Alice in Wonderland, Animation, Armatures, Character design, Dali, Elysium, Eurydice, Evan Wilkinson, evanmakesfilms, evwilko, Greek myths, Greek Tragedy, Hirokazu Koreeda, Jan Svankmajer, Model Animation, Myth, myth of orpheus, Mythology, Orpheus, orpheus and eurydice, Plasticine, Production Design, Puppet Animation, Puppets, Set Design, Set dressing, Sets, Short Film, Snake, Stop Frame, stop motion animation, Stop-Motion, Surrealism, The Red Shoes, The Wizard of Oz, Underworld, University of Westminster on May 30, 2013 by Evan Wilkinson.